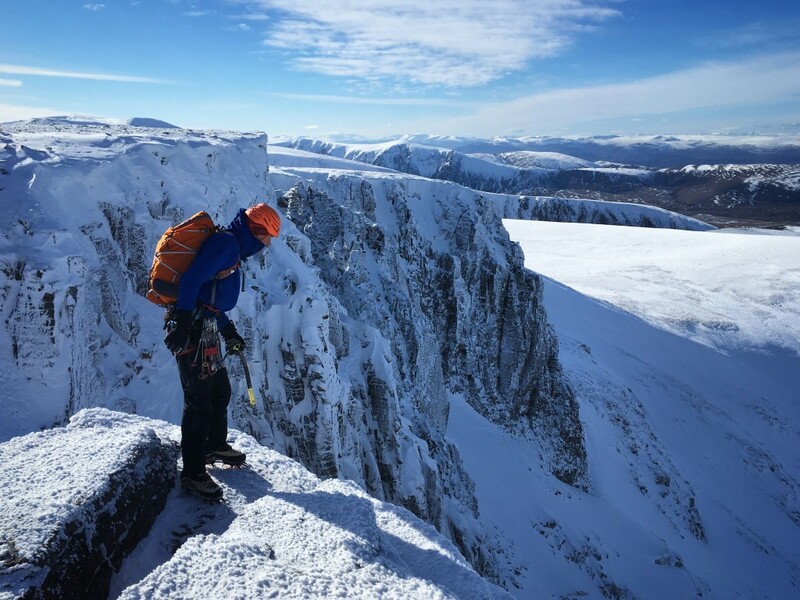 Often considered the biggest hurdle in the process of becoming a British Mountain Guide, ‘Scotland’ wasn’t without its ups and downs this season. A monumentally crap season conditions-wise (perhaps the worst in living memory?) coincided with the longest period off work I have had since I actually started work back in the late 90s. Balls. 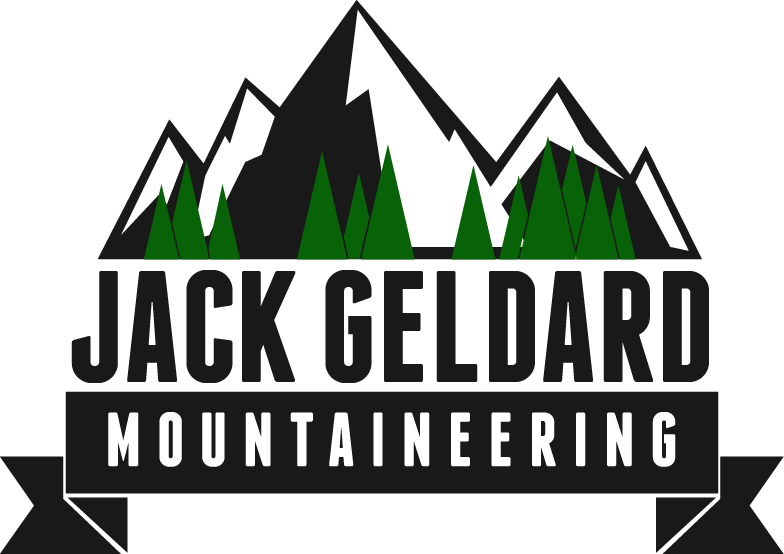 So, the BMG Scottish training and assessment breaks down like this: A 1 week training course based on the West Coast (mainly Ben Nevis for us) is run by Tim Neill and gang. This for me was a bit of a baptism of fire, coming from several months of back to back 7-days-a-week plastering, thus not being particularly hill fit. In an ideal world I would have been firing on all cylinders for this course, but the realities of financial strains and zero winter conditions meant that I had done the sum total of 1 winter route (Tower Ridge) prior to the kick-off. 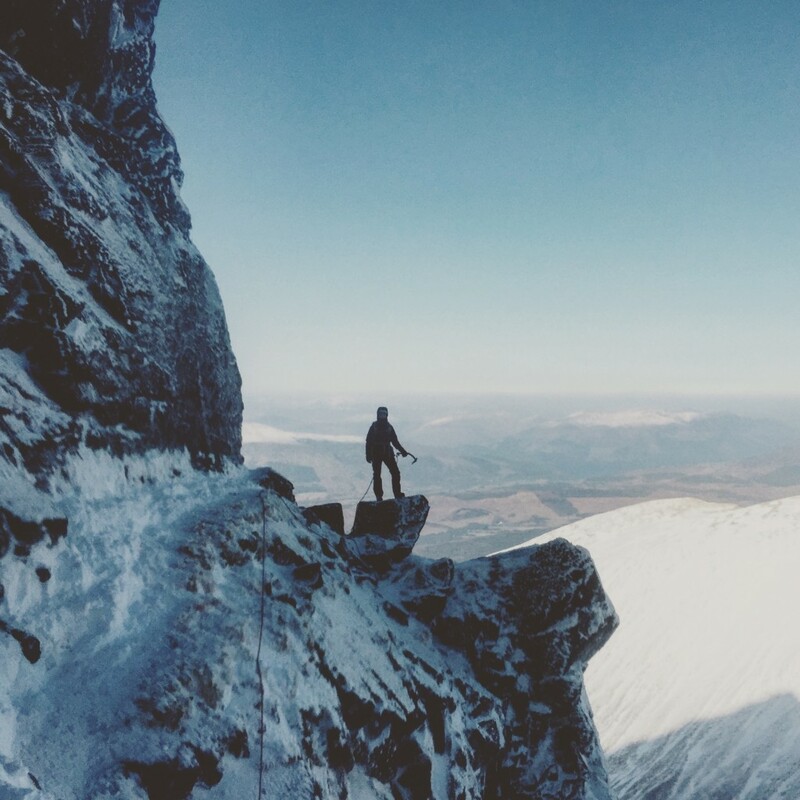 We covered all the techniques required for guiding in winter, mainly short-roping on snow, ice-axe belays, and looking after clients in the hostile environment of Scottish winter. Looming 6 weeks later on the calendar was the winter test. 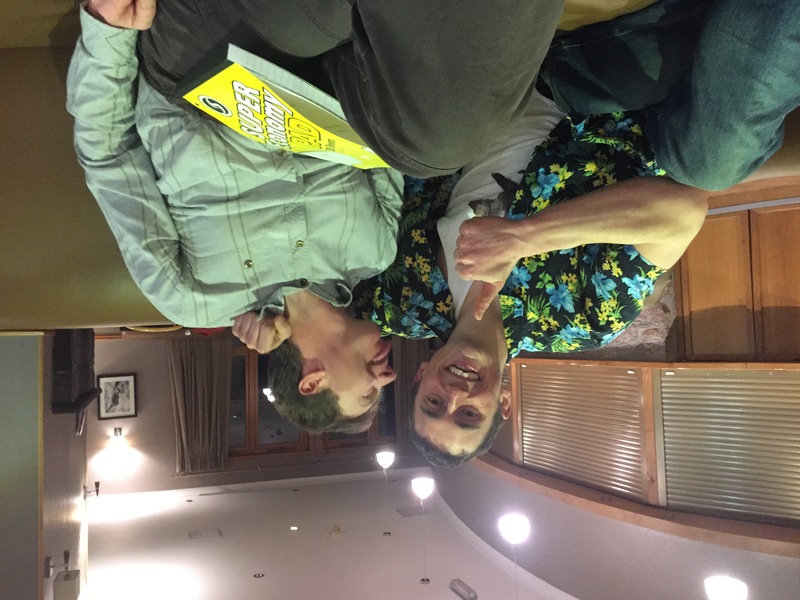 I stayed in Scotland for the whole time between the training and the test, and for anyone who is considering becoming a BMG Guide, then you should too. I opted for a 6 days out of 7 ratio of going out on the hill, and yes I was pretty tired of it by the end of the season! I did manage a total of 44 different Scottish winter routes this season, not including doing some (such as Tower Ridge) 3 times! Teamed up with the supremely talented Guy Steven and being assessed by Stu McAleese, we set off in to the Cairngorms on a pretty good forecast. Straight in to the Northern Corries, we proceeded to romp up and down broken ground and easy gullies up to grade 2 (Aladdin’s Couloir etc) showing Stu how we can manage terrain using a single rope. Techniques included short-roping, short pitches, snow anchors, lowering and abseiling. This was done with a large expedition pack, a small rack and a single 60m rope. We then headed to the area in Coire Domhain where it is common to find snow holes. Temperatures were too warm for safe snow-holing, so we re-dug an existing hole to remove its sagging roof, made it safe and hunkered down for a couple of hours of brewing up and making some food. As evening rolled in we set off on our navigation round, which covered approximately 8km and was based around the Cairngorm Plateau. The first few legs were done in daylight, and were a good warm up, with various features on the map being picked out, from ring contours to re-entrants. As the daylight began to fade, Stu chose a few points for us that were more realistic, such as the tops of different routes in the Northern Corries, and also Stag Rocks. We demonstrated our navigation skills by describing a navigation plan, then following it, so this exercise was about more that just ending up at the right spot. In the end we yomped down the hill to spend the night under the Shelterstone, and as I had been there a couple of weeks previous I led the final stretch to the boulder. A muddy but comfortable night followed. The next morning was more of the same, with a mixture of descending and ascending couloirs, navigating to the top of named routes, and then followed a teaching session – with Guy and myself demonstrating how we would teach skills such as step cutting, ice axe arrest and also digging a snow-pit. Having never worked as an MIC I was a little bit more rusty than Guy at this section of the test, but luckily I had practised this and had some lesson plans in mind. This day was postponed due to bad and warm weather. We completed it the following week. 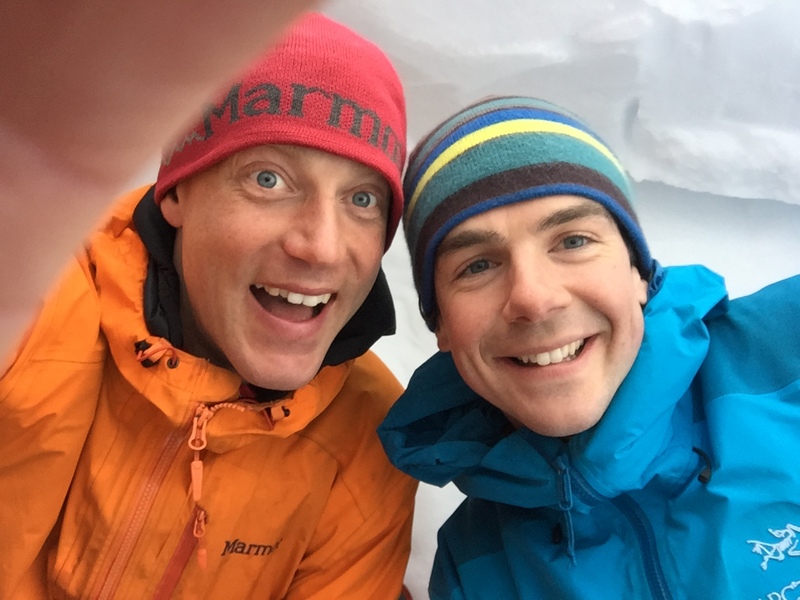 A very early start to get temperatures cold enough to climb ice on Ben Nevis (yes we left about 3:30am) saw myself and Guy Steven teamed up with Ewan Whittaker for a day of ice climbing. We found some ice pitches of varying levels of solidity to the right of Green Gully. As with the summer test, don’t expect these ‘personal climbing’ days to be about personal climbing. We short-roped to the crag, pitched some of the approach, pitched some of the descent, and short-roped some of the descent. 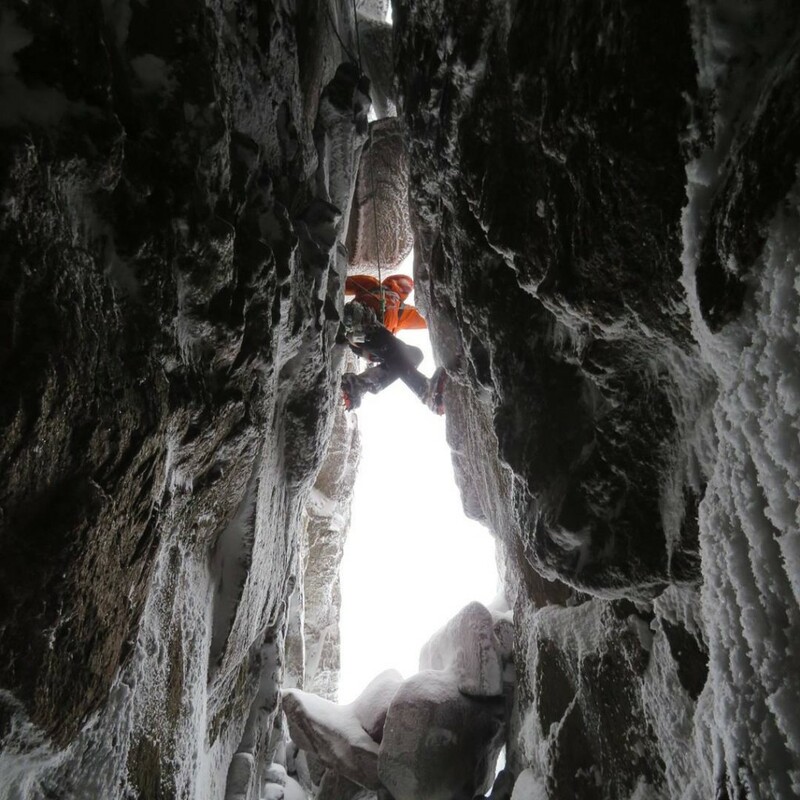 We also covered stacked abseils, and of course Ewan watched our personal climbing performance on grade 5 ice. Me getting stuck in to some not very well stuck on ice on Ben Nevis! Ewan took 3 falls whilst I was short-roping him, the first of which was on the first step after I put the rope on, so the motto is to be ready as soon as that rope goes on. We had a great day with good banter and a relaxed atmosphere and our debrief in the CIC hut over a brew was most welcome as the weather worsened at lunchtime! A very poor forecast gave limited options on this day, but it did give us candidates a chance to show what we would do with a client in such poor weather. My first thought was that I would cancel the day, such was the forecast (wind and rain), but that of course wasn’t an option so we battled in to Sneachda to do our best. I was being assessed by Graeme Ettle and my ‘client’ was Karen who competes in drytooling competitions, and has led E5. I opted for a morning of teaching skills, and after a discussion with Karen it was clear that the area she knew least about was Alpinism, so that was my teaching focus. My plan was to build these skills in to a small journey and finish by using all of the new skills on easy snowy ground near ‘Point 5 Gully’ in Sneachda, as I felt there really wasn’t much safe climbing to be done. Graeme had other ideas though, so we headed for a buttress of rock right of Fiacall Couloir. This was the toughest day of the assessment by far for me, and the loose rocky ground to get going threw me off track a little. After a bit of faffing around with crampons off, then back on, I got a little bit more rhythm and managed to guide us up a couple of nicer bits of rock, topping out on to the Fiacall Ridge, which we descended. After only having fairly positive feedback on all my days so far through the test, and from the summer test, this was a little different, and left me thinking that I had blown it, and would need to resit this day. Graeme’s feedback at the end of the day wasn’t very complimentary, however I knew that above all I had been safe throughout (essential), and we had actually achieved a reasonable amount on what was a very poor weather day. As I didn’t defer at the end of the week, I can only assume that it was a borderline day, and the rest of the week made up for it. I had Karen again on this day, and was assessed by John Lyall. John’s relaxed attitude, coupled with better conditions meant that I enjoyed this day much more than the previous client day, even though I felt nervous as I assumed a lot was riding on my performance. The pressure of this test really can’t be overstated, as it has a huge impact on your career path, earning ability, and quite simply it is really, really expensive to put your life on hold for 3 months and move to Scotland. The thought of another few months in the back of my van, trying to dry my socks over a jetboil spurred me on to make sure Karen got as many technical pitches of climbing under her belt as possible, but without rushing the day along and making a mistake. 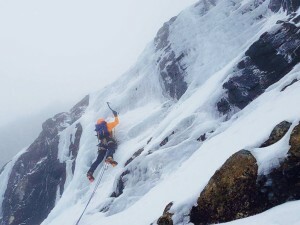 We climbed Original Summer Route, then abbed off in the Alladin’s Couloir, before moving over to the Mess of Pottage and climbing the first few pitches of the Message, before abbing off to make our cut off time of 4pm back at Glenmore Lodge. This day involved a fair bit of short-roping of Karen, and some stacked abseils, and I had planned it that way, so that I could demonstrate these skills to John. My performance the previous day hadn’t really given many opportunities for this kind of thing, and if the assessors don’t see it, then they can’t tick it. Apart from a twist in the rope that I caused by forgetting which rope was on which side (rushing! ), the day went pretty well, so I had my fingers crossed for the evening’s results and felt it might be 50/50. We all got fairly steaming drunk whilst waiting for our results, which took several hours. I think I went in to get mine at around 23:30pm, and had had 7 pints and a couple of single malts in the intervening few hours, so apart from the feeling that Graeme was giving me a bollocking, I don’t really remember exactly what was said, except the surprising announcement that I had passed! This was conditional on passing the remaining mixed day, which I was fairly confident about. 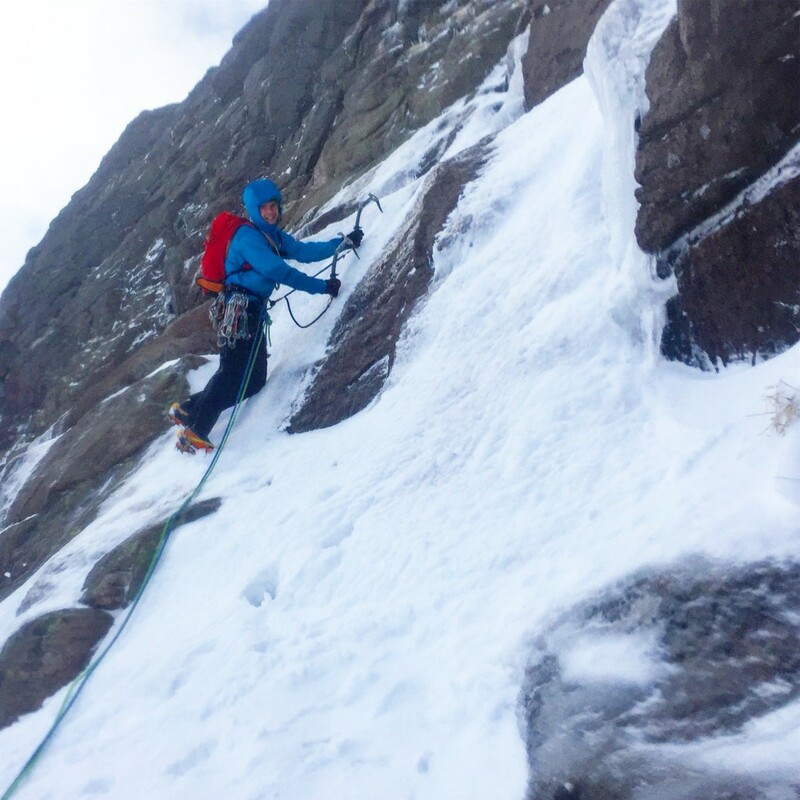 After waiting around in Aviemore for a few days twiddling our thumbs, Guy Steven and I headed out in to Coire an t’Sneachda for one final time, accompanied by Jonathan Preston. Temperatures were below zero, but the routes were pretty black. We needed to get a route done, so despite ethically marginal conditions (there was ice, honest – see the photos!) we nabbed Pot of Gold in gale force winds, and called it a day. Jonathan was fantastic, very professional and calm, and the day went off without any major issues. 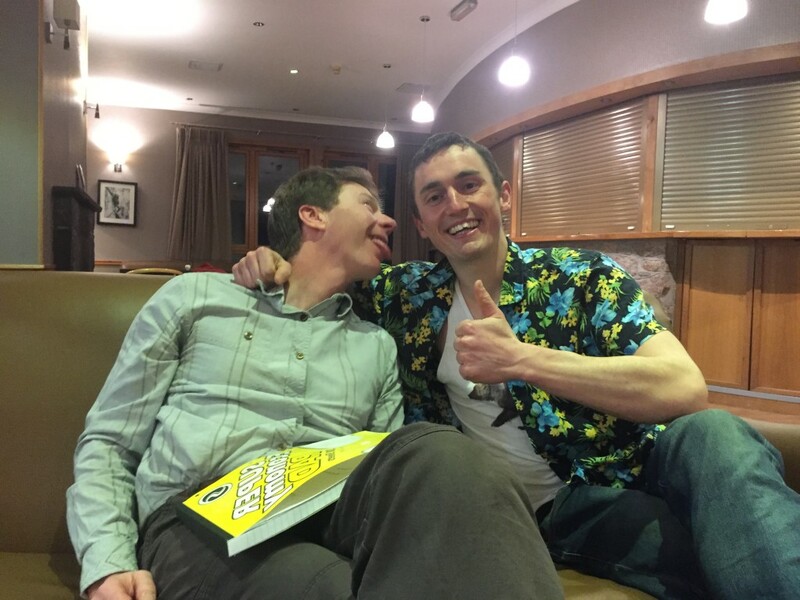 When Graeme started handing out the results back at the Lodge, his opening gambit to me still made me think that I had failed, but again he uttered the magic ‘pass’ word, and (I won’t mince my words!) I started my engine and fucked off out of there, leaving a world of stress behind me. I had a great season, climbed some good routes considering the conditions, and on the test I went through the psychological wringer that so many have gone through before me. I won’t be burning my guidebooks though, as the BMG Winter Test doesn’t represent Scottish winter climbing to me, and I still love that feeling of finding that sinking hook, of your world turning from total meltdown to total glory in the swing of an axe. And that feeling – when you stumble across a route in good condition – that feeling that you’ve just stolen something, or got one over on the Gods. That for me is Scotland. And I will be back.